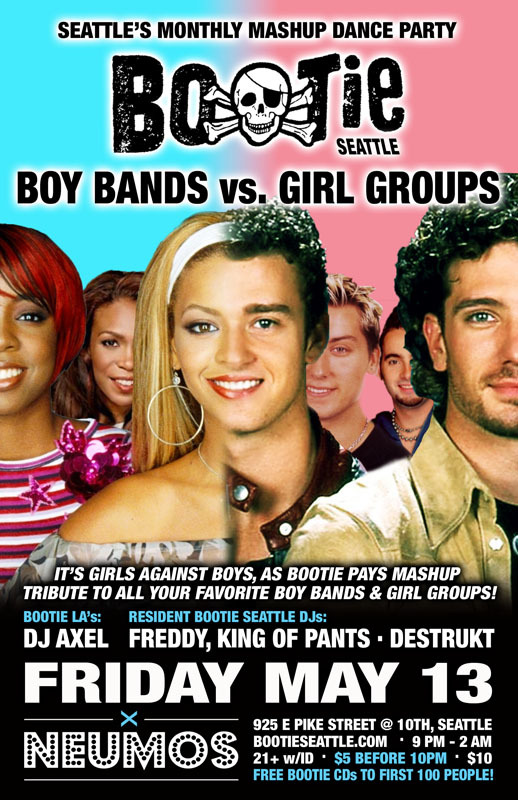 It’s girls against boys, as Bootie Seattle pays tribute to the best boy bands and girls groups in the world as Bootie LA’s DJ Axel joins resident Bootie Seattle DJs King of Pants and Destrukt to mix and mash them up with anybody and everybody! Only $5 before 10 PM! It’s girls against boys, as Bootie pays mashup tribute to all your favorite boy bands & girl groups! Bootie Seattle pays tribute to the best boy bands and girls groups in the world by mixing and mashing them up with anybody and everybody! Backstreet Boys or Spice Girls? N’Sync or TLC? Duran Duran or the Go-Go’s? Jackson 5 or the Supremes? No group from any decade is safe from the Bootie mashup treatment! Special guest DJ Axel from Bootie LA joins resident mashup DJs King of Pants and Destrukt to spin the best of the boys and girls into a non-stop mashup dancing frenzy all night long! Launched in 2003 by San Francisco DJ duo A Plus D, Bootie was the first club night dedicated solely to the then-burgeoning artform of the bootleg mashup — and is now the biggest mashup event in the world, with regular parties in several cities. Winning various nightlife awards for the past 12 years, Bootie celebrates pop culture both past and present, keeping your brain guessing and body dancing with creative song combinations. Mixing and matching every musical genre, era, and style into one big dance party, it’s a place where everyone is welcome. And with free mashup CDs given away like candy, Bootie provides the soundtrack for the A.D.D. generation. © 2019 Bootie Mashup | All Rights Reserved.